Cozy Cabin with a bed/bath on each of the 3 levels ideal for multiple families! Echo Place has over 1,580 SF of living area with lots of surrounding porches and decks. A bedroom and bath on each of the three levels makes the ideal setup for up privacy when more than one couple/family come together for fun in the Smokies. Sleeps up to six (6) adults and three (3) children comfortably. Plenty of very well lit parking for at least 4 vehicles. Zero steps to the main level! The Main Level features a bedroom with King bed and bunkbeds for kids/teenagers, HDTV and DVD player. The bathroom is shared with the main living area. Open kitchen/dining/living room with HDTV/DVD Player and Bluetooth surround sound to stream your own music. A huge stone fireplace, soaring ceilings, plenty of glass/french doors to the decks and woods make this space seem huge. The deck space off the main level includes a large covered porch with picnic table, open decking with adirondack chairs and a bar w/seating to take in the views and mountain air. Also a half-court shuffleboard off the parking lot makes for great outdoor fun. The hiking center is at the entrance with 3 sets of hiking poles, binoculars, and a ruckpack full of emergency items. The Loft Level features a Queen bed w/child sleeping area, private bath and french doors leading to a nice balcony and sitting area. HDTV w/DVD player. The Lower Level features a third bedroom with King bed, HDTV and DVD player, UT themed laundry room, and a recreation room. The bathroom is shared between the rec room and bedroom. Recreation includes a beautiful handcrafted shuffleboard table, a foosball table, and a 3-in-1 bumper pool/poker/game table. Comfortable sectional for viewing movies on the large surround sound HDTV with Bluetooth theater. Plenty of movies and games provided for your use as well as several board games. Off the Rec Room is an enclosed screened in porch with a bubbling hot tub and comfortable seating to take in the night. A grille area is just outside (bring your own charcoal). Cable TV and Internet provided along with plenty of movies onsite for family movie night. Jay is a retired Air Force officer and currently works as a contractor at Shaw AFB, SC. Jay went to Architecture school at the University of Tennessee in Knoxville where he and Susan fell in love with the Smoky Mountains area during weekend getaways. Susan owns a home daycare center and has provided childcare all over the world as the Air Force moved us from place to place to include Japan, Germany, and a myriad of stateside assignments. We have five children and the cabin has provided a wonderful place for our family gatherings. 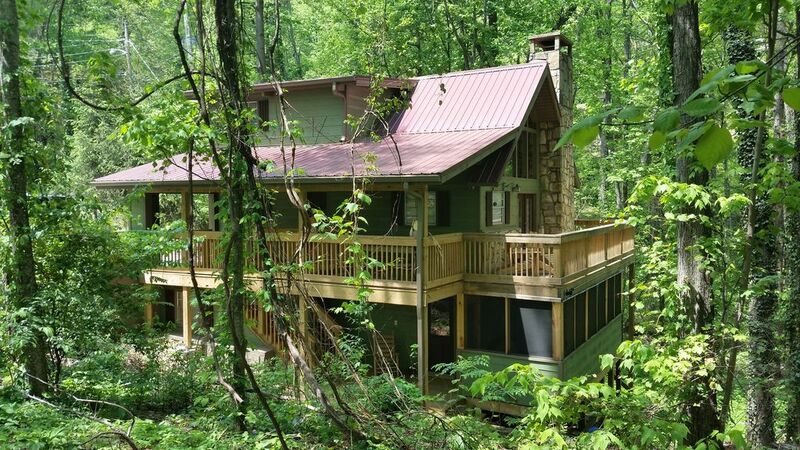 We bought this cabin because it was so close to Gatlinburg and it was nestled in the woods just the way we wanted. Zero steps to main level, easy access drive, and plenty of parking. Winter mountain views and seeing the Ober Gatlinburg Tram is really cool. We've spent the last couple years remodeling and putting our special touch on the place. We've already had lots of memorable outings with friends and family in our home away from home. Plenty of space for a family get together! We know you'll enjoy our little cabin in the woods. Additional infrared heater available in the lower level as it's usually a little cooler than the rest of the cabin. PLEASE no muddy hiking clothes! They are regular not commercial washers. Bring your own detergent. Provide your own firewood. Open damper prior to using. Close upon departure. NOTE: Buy wood from area versus bringing own to avoid bringing evasive species to the mountains. Please no pine. Plenty of paved parking for 4-5 vehicles. Place wet towels in bathtub upon checkout. EACH Bedroom, Living Room and Rec Room has HDTVs and DVD Players. Stream your own music from your phone thru the Bluetooth music systems. Hiking, waterfall and area books onsite. Beautiful custom 9' shuffleboard table, foosball, bumper pool table, poker table, outdoor half-court shuffleboard and board games at cabin. Lots of family board games onsite. Small selection of CDs onsite. This is a BUMBER pool table. Instructions on how to play mounted on the wall. A box of Legos is onsite. 3-4 person balcony bar for sipping coffee and drinks. Loft has it's own balcony. LOTS of deck space to take in the mountain atmosphere. Covered porch with 8 person picnic table for outdoor dining. Great location, great amenities. Very comfortable stay and fully equipped kitchen. Close to everything, but very quiet. Thank you! We came up for the Orange and White game and Our stay was stay was nothing short of excellent. Everything from interacting with the owner, to the actual property itself. Excellent! Thank you for your service as well Jay. IYAAYAS!!! The house was everything I expected and more. So close to Gatlinburg and all the hiking spots we wanted to venture to. The house was clean, comfy and cozy. Perfect for two families. The kids loved the game room. The beds were very comfortable and there was more than enough room. When we come back we will be booking again. A nice relaxing get away. We saw a bear outside the cabin and enjoyed the weather and the hot tub. We stayed mostly at the cabin and made all our meals there to enjoy time together. Great cabin. Recommend staying at this cabin. Cabin was easy to find. Beautiful home. Would stay there again. Loved it. Easy access to Ober and downtown Gatlinburg. Thank you so much for your great review. Susan and I appreciate your business and look forward to having you back. We had a wonderful time. This cabin is very close to the strip in Gatlinburg . Jay and Susan are great to work with. There were a few minor issues and they took care of them immediately! Thanks for your review Melissa! Glad you enjoyed your stay.